During the molt your birds lose and have to replace a quarter of the total amount of protein in their bodies. The protein Keratin makes up the feather. Keratins are proteins that are made inside the body using amino acids as the foundations. Forming the perfect feather without correct nutrients is very difficult. The energy needed for a new feather growth is 2.5x more than the energy needed for egg production. What triggers the molt to begin can be affected by many factors - age, season, day length, hormone levels and breeding cycles. The molting season starts after the breeding season. It is, in fact, the process that stops the breeding season. Nature has ensured the "survival of the fittest" by having the molt immediately after the breeding season. The molting cycle for most birds is one year. Some birds have a twice yearly molt while some large parrots have a two year molt cycle. The Gouldian has the ability to speed up (Compress Molt) or slow down (Delayed Molt) their molt cycle depending upon the availability of food. In the wild, the Northern Territory of Australia can be a very harsh place from year to year. The seed supply can fluctuate greatly. If the seed supply is inadequate the Gouldian will be forced to compress their molting time (speed up the molting cycle) to ensure the molt is completed before the end of the food supply. Researchers believe this is an evolutionary adaptation to the unpredictable climate changes in their natural habitat. Seldom do we see a Compressed Molt in our captive birds. However if any of the circumstances listed below occur during what should be the molting period for your birds, you will experience a Delayed Molting cycle which can lead to your birds going bald, even if a breeding cycle does not follow. 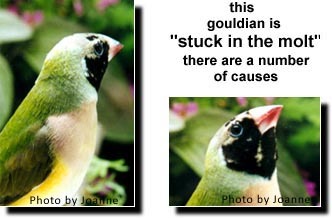 Gouldians begin to molt the first 4 primary flight feathers as early as July in Australia, early March in the U.S. This happens in the wild and in captive birds. 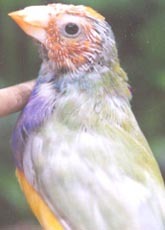 When captive Gouldians are permitted to continue breeding past the development of these first 4 Primary Flight feathers they will trigger a Delayed Molt of the remaining Primary Flight and Secondary Flight feathers to insure that their dietary intake is reserved for chick rearing and not feather production. This delay can bring a halt to the molting cycle. 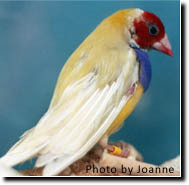 Captive Gouldian finches carry between nine and ten primary flight feathers. The primary flight feathers molt one at a time in an orderly sequence. One or two adjacent flight feathers growing at the same time insuring the bird will be capable of flight of any time during their molt. The 4 inner most Primary Flights molt first, before the rest of the Primary Flights, Secondary Flights and the body molt. This photo was taken well into the annual molt cycle, illustrating this bird has stalled its molt after the 4 primary flight had been replaced. The Primary and Secondary flight feathers are very old and fragile. The 9th and 10th Primary Flights have been broken off. Molting prepares our birds for breeding. When the birds are not given sufficient time for a complete seasonal molt, the following breeding season is normally not successful. Many of the birds will also develop balding problems. Individuals born at the beginning of the breeding season start to replace their primary flight feathers within a month of fledging. This will vary according to diet, temperatures in which they are housed, and the individual breeding line from which they have come. Some family lines color out faster than others, but 3 months is usually the norm. This molt can last for 3 to 4 months depending on the quality of the diet. Remember: every feather that was produced while the baby was in the nest must now be replaced by an adult 'colored' feather. Molting takes place in a pre-determined fashion so the bird is not left flightless. 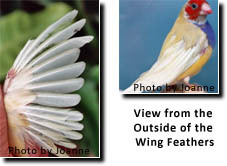 Generally the wing feathers are replaced first, then the body feathers and then the tail feathers from the center out. Powder down feathers are replaced continuously. Sometimes the juvenile will get "stuck" during this molt, and not complete the process. This particularly happens in the head area, and sometimes in the breast. There are several reasons why this happens. If the diet conditions are ideal, the bird will complete the molt process when it goes through it's first adult molt in another year's time. Starting with the first adult molt and continuing every year thereafter, birds' go through some sort of molt. Some years they go through a very light or short (1 month) molt, and in other years they go through a complete (3 month) molt. 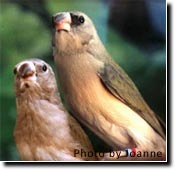 The molt cycle for most birds is one per year. It is important that your birds are in peak condition as they enter their annual molt. This would require at least a 4 to 6 week resting period between the end of their breeding cycle and the beginning of their molting cycle. 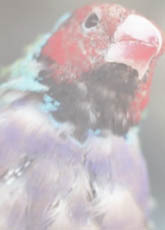 Gouldians start to molt the first Primary Flight feathers in late July in Australia and late February, early March in the U.S. 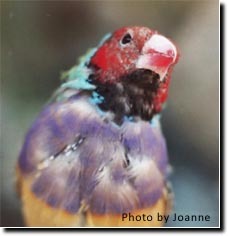 The peak molting period is in September/October in Australia and April/May in the U.S. This is why most owners are not even aware that the molt is beginning. Therefore pulling the nest by mid to end of January will ensure that the birds have the appropriate amount of time to rest before the first 4 Primary Flight Feathers begin to be replaced in late February. 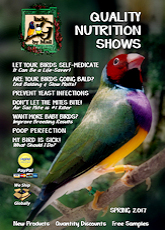 I have been raising birds over 58 years and I still do not consider myself a "subject matter expert" on avian nutrition. I count on the products that I have used on my birds over the years. 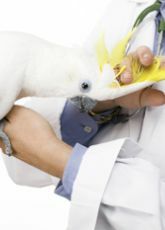 We offer several products to help your birds come through the molt as quickly as possible. Feather Fast provides the Sulphur containing amino acids along with a well-balanced total protein source, vitamins and macro and trace minerals. 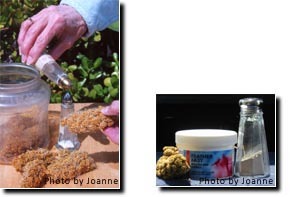 Feather Fast can be applied onto their soft foods fruit, vegetables or soaked seed. 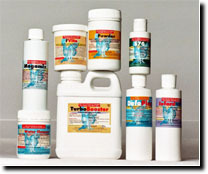 Feather Fast used in conjunction with Calcium Plus will ensure adequate supplies of a highly available form of calcium. This combination enabled my birds to make feathers even more efficiently. If you have birds which seem to enjoy only dry seeds, "sprouted seeds" can be the answer towards providing them with all the vital nutrients they need for a healthier and faster molt. This really works! Research shows that there is a decrease in the immune function of birds during the molting cycle. Birds with a strong immune function can keep the population of airsac mites in check outside of the molting season. When temperatures and humidity fluctuate during the molt, the mites that are dormant within their respiratory tract begin to multiply and further stress the birds. For best results start treatments with S76 before the Primary Flight feathers (early March) begin to be replaced. Treat with S76 for two days each week for three weeks. Continue the treatments one day each month, until one month after the conclusion of the annual and juvenile molt. There is a great energetic cost for flight feather growth with daily energy expenditure increasing up to 20% during the peak period of the molt. Protein requirements are also increased during the molt as feather mass comprises 20% of total body protein. Unless these are supplied, the bird will use up what reserves it has and then begin to reduce the quality of the feathers it is growing. Offering your birds the proper nutrition during this stressful season will ensure they complete the molt quicker, reduce their stress, making them happier and healthier.